For years the value of a college degree has been determined by the easiest outcomes to measure—namely job and graduate school placement rates and alumnae/i salaries. These metrics have some merit, but Goucher understands its students are seeking even more from a college experience. Gallup and Purdue University created an index that examines the long-term successes of graduates as they pursue a good job and better life. Goucher partnered with Gallup to see how its alumnae/i are faring and how well it prepared its students overall for a good life. Surveyed between October 12 and November 11 of 2015. Divided into two cohorts: 1950-1989 alumnae and 1990-2015 alumnae/i. Those with a bachelor’s degree from four-year public, private, for-profit, or nonprofit institutions in the U.S. Group is female only for 1950 to 1989 and co-ed for graduates from 1990-2015. From small and highly residential four-year universities with a focus on the arts and sciences. 1950-1989 female cohort included in the combined total graduates. 1950-1989 female cohort included in the combined total graduates. Universities include: Allegheny College; American University; Beloit College; Bennington College; Boston University; Brandeis University; Bryn Mawr College; Clark University; Connecticut College… More. 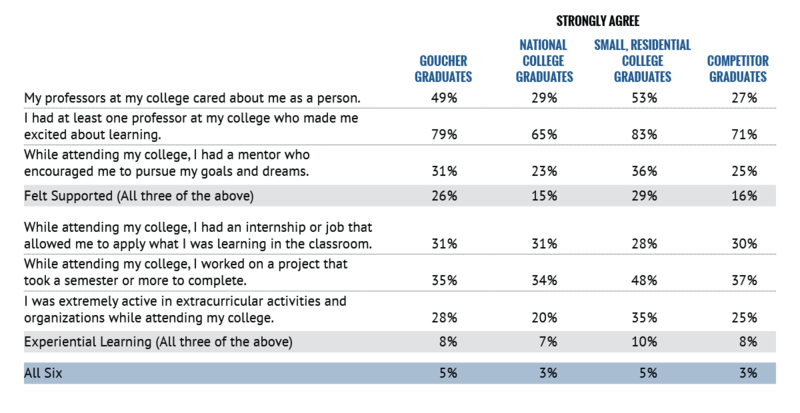 Goucher graduates are more engaged at work. The number of Goucher alumnae/i thriving in all five elements of well-being (purpose, social, financial, community, and physical) is almost double the national average. 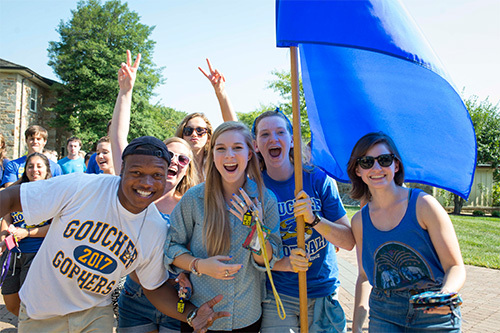 Goucher outperformed its competitors and the national average on all but one of these “magic six” indicators that measure the effectiveness of the undergraduate experience. Gallup’s research has found the overall educational experience and emotional connections students make while in college are what really leads to both professional success and well-being. Certain college experiences could double or triple workplace engagement and well-being.